Originally Published in DeneenBorelli.com on 4/29/14. The actions of the NAACP are more deplorable than the racist comments by Los Angeles Clippers owner Donald Sterling. The Sterling episode is instructive because it brings to light just how far the NAACP has strayed from its original mission. Instead of promoting all blacks, today’s NAACP is a liberal front group only concerned about raising money and advancing left-wing causes. For example, the NAACP will deny me – a black conservative – an opportunity to speak at its national convention but will provide cover for Donald Sterling’s racist past. Of course, Sterling’s comments about blacks are outrageous and deeply hypocritical, especially since he profits from black basketball players. He was happy to make money from black athletic skills but did not want to see blacks in his audience. What’s worse, however, is the conduct of the NAACP. The organization ignored Sterling’s racist past by giving him a lifetime achievement humanitarian award shortly after he settled a $2.73 million government lawsuit over housing discrimination against minorities including blacks. In addition, Sterling was sued by Elgin Baylor the teams former general manager over racism claims. 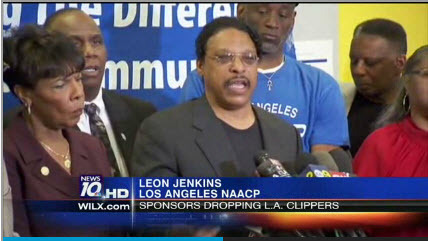 Five years ago, when the local chapter of the NAACP wanted to give Clippers owner Donald Sterling a lifetime achievement humanitarian award, Los Angeles’ African American community was divided. Sterling had been a prominent donor to the NAACP chapter for more than a decade. He ran newspaper ads touting his charity’s generosity to L.A. organizations that help the poor communities. But the real estate magnate had just paid $2.73 million to settle U.S. government claims that he refused to rent his apartments to Latinos and blacks in Koreatown. “The NAACP airbrushed this away and simply said that Sterling has been a gem in giving oodles of tickets away to needy inner city kids and ladling out some cash to charities and sports camps for them,” community activist Earl Ofari Hutchinson wrote at the time on his website. The organization decided to go ahead give him the award. And in May, it was set to hand him a second honor as part of a gala marking the NAACP’s 100th anniversary. Last year, the NAACP ignored my request to speak at their annual convention and I’ve written the organization this year to request a speaking slot for myself and FreedomWorks Senior Fellow Rev. C.L. Bryant. The organization has yet to respond to my letter and I’m not optimistic. I wonder if I’d get an invitation if I wrote a big check? No download and registration required this game,such a very interesting and mined based game,now one a single click here this site http://solitairetimes.com i am sure you fully enjoyed and easily to play. its not just the money that talks. It helps...but Its the visions of board of directors and trustees and their relationships.